LONDON ROAD documents the events that shook Suffolk in 2006, when the quiet rural town of Ipswich was shattered by the discovery of the bodies of five women. The residents of London Road had struggled for years with frequent soliciting and kerb-crawling on their street. The film follows the community who found themselves at the epicentre of the tragic events, and is based on interviews conducted with the road's real residents. 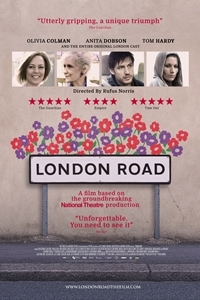 Using their own words set to an innovative musical score, LONDON ROAD tells a moving story of ordinary people coming together during the darkest of experiences.